I originally wanted to buy a Animal Crossing case but realized that they are all see-through so it wouldn’t look nice with my red 3DS as the background. The Yveltal case I laid my eyes on was perfect though! It’s also see-through and the details (Yveltal, name and framing) are in gold. I got it on the 30th (5 days after making the order). Wrapped in bubble plastic and encased in newspaper. I got two stickers as a bonus! :D And while lifting out the newspaper from the bottom I noticed this little folded note: Best seller EVER. I really do recommend him! So what does the case look like? Tadaa! It’s so pretty~ The case changes the color of the system slightly. It also has a protective back-side but there’s nothing on it (and that’s why I didn’t bother taking a picture haha). I took off everything I had hanging and exchanged them for the things I have on the picture. Sorry for not blogging, I haven’t been in the mood even though I’ve gotten some things in the mail (all the season of Angel, Lollipop Chainsaw and Catherine)… pretty sure it’s because everything seems to break at the same time (my iPod, bed, computer and phone) :c Urgh. Let’s continue the post! They are really starting to show~ So pretty! Today has been great. I woke up 10 minutes before the electricity came back on (the black-out lasted 5 hours) so I didn’t have to wait long before I could use the computer to search something that had been nagging me! Then we drove to the supermarket and I found my new (fully enjoyable) favorite dark chocolate. I’m not a real fan of dark chocolate but this one is perfect! I also bought Nemi issue 5 and a package of cream brulée mix. But the main reason we went there was to buy ingredients to make tacos (we haven’t made it in months). :D So we came home, prepared everything and ate *mm-m*. I decided that I don’t have enough willpower to water all my flowers everyday in AC:NL so I changed my town ordinance from Night-Owl to a Beautiful Town! I’m pretty sure I’ll miss the late-night visits to Timmy/Tommy but hey, I survived before I could establish ordinances so it’s cool. I’ll finally get the T&T Emporium tomorrow! I didn’t get my first visit from Gracie until just five weeks ago ;_; And I had had the T.I.Y. for a month or so before she came uhh. I will probably let her go haha. Out on November 8th in Europe, exactly a month away folks! These pictures (among a few others) were uploaded today on Nintendo 3DS UK’s FB-page, see them all (here). You can tell that the series is going out with a bang! Nintendo 3DS UK’s FB-site started a X&Y countdown as their cover photo today. I’m not doing a Pokemon countdown this year. A reason is because X&Y are released simultaneously everywhere (= less legit information posted). The other (and main) reason is that I’m trying to know as little as possible, to not spoil the experience. It’s not that hard because I don’t feel tempted (which now that I think about it, is weird Ö_Ö I should be ecstatic!). It’s the first time I buy both the games in a generation and the first time I buy the guide for the games. I truly believe that this pokemon experience will be beyond epic! You can buy the bed for 4400 bells from the catalogue and sell it for 1100 bells at Re-tail. AC:NL, let the month of Halloween begin! 400 bells for a piece of candy~ And all the pieces from the Spooky series cost 4124 bells each! Attention all Animal Crossing: New Leaf players! Blue Pikmin room to the left Red Pikmin room to the north Yellow Pikmin room to the right Winged Pikmin room on the second floor Aaaand the Stone Pikmin room in the basment! The furniture in all the rooms except the main room is stuff I own but I see some Lovely furniture that I will order tomorrow or the day after that since I will buy everything in the main room *urgh… my precious bells ;w;’*. The Cupid bench is so pretty too! I was so sure it was Monday since my brother told me to hush last night when I talked to Merielle via Skype. Animal Crossing progress has been going smoothly ^^b I just realized I’ve gotten my first HHS visitor and he has some pretty cool stuff! I’ve also been on the island a few times. Gardening shop opened a few days ago and the Nookling Junction will be closed tomorrow for renovation which means that I will get Club101 in just a few days! I also got a Retro stereo from Genji today when I gave him a balloon table which means that I will be able to have music in my house *woho!*. The AC:NL experience so far. I have visit Arashi, Omejikat and Yunie though. Second day. Visited Omejikat for the first time (we played music beautifully. Arashi laughed at my face when I got stung by bees two times. She visited my room. I had done my room all sky-y (with double rainbows, a ballon bed and ballon lamp) and I got my Pikmin. I won the bug-catching competition. 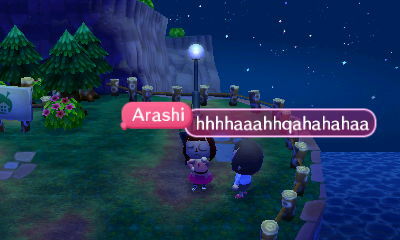 And I hanged out at Arashi’s place. Yesterday it rained, both in reality and in the game, Arashi & Omejikat visited at the same time. On the evening I went over to Yunie and got to see her awesome town (she’s done a lot in three days!). Club101 is so nice *dancing*! When I get new shops and flowers and fruit, everything will be so awesome! :D This game is super addicting because it’s so slow paced (if you don’t sell all your fruit and fish/pick up stuff from the beach all the time the first few days). What I’ve gotten in the mail the past week! Such a different game and a really fun way to pass time… getting all the medals and Pokémon in the courses is addicting! The next package that arrived was my ear stretching set from the seller Never86 on Amazon! Stainless steel tunnels from 1.6mm to 10mm (16g to 00g). Stainless steel tapers, also from 1.6mm to 10mm! They came like this, in ziplock bags! Aww ;w; You see the little tree you planted at the major ceremony in the middle! Loving the DS stand you got with Pokemon Typing Adventure (you can also get it with Kid Icarus Uprising *don’t have that one though… yet*). I can browse through internet and run around with one hand at the same time haha! x’D Tommy at Nookling Junction and Reese at Re-Tail are so cute. My villagers are also freakin’ adorable! I have to do a post on my Animal Crossing experience when I’ve settled in and such :3 Hope you’re looking forward to it as much as me! AC:NL countdown is at its end! Think of all the different stuff you can do each season! And all the customization you can do!